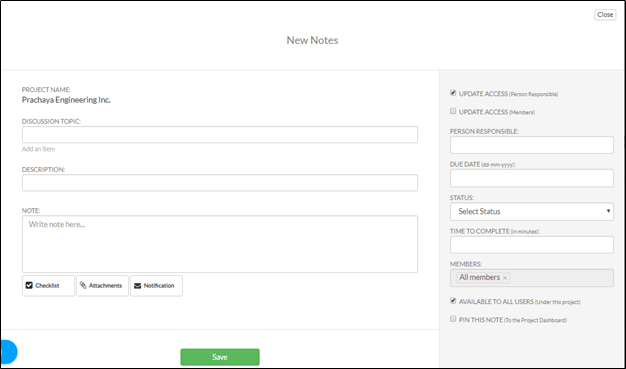 Notes Tool allows you to upload drawings, specifications, or any document associated with your project. You can upload either through your device/computer, Google Drive, One Drive or Dropbox. From your project page, go to Communication tab. Type in 'Notes Tool' from the search bar located on the upper right corner of your portal. 3. Fill out the fields. 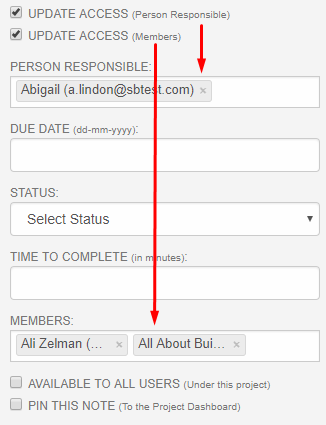 When the Notes Tool is accessed inside the project, the Project Name is disabled and automatically populated. You can enter many discussion topics here using the Add an item link. This field saves your discussion topics and displays it as suggestion the next time you will create a note with the same discussion topic. Type in a description of your note here. You may discuss the full details of your note in this area. You can add your own checklist on your notes by simply enabling the Checklist button. You can add New Line for multiple items. You may tick the checkbox to mark the item as done/resolved. You can upload attachments by simply enabling the Attachments button. Click Add to attach multiple files. You can upload from your device/computer, Google Drive, Dropbox or OneDrive. Click Delete to remove uploaded file. 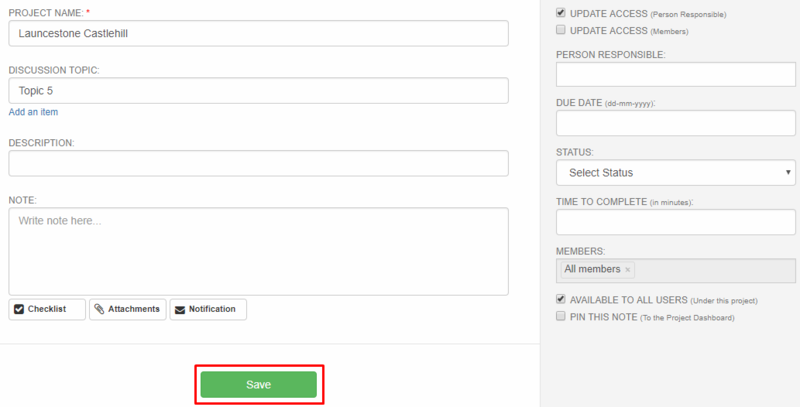 If you enable this button, users involved in your notes will be able to receive an email whenever there are any changes. If you checked the Update Access (Person Responsible), it means that the users you entered on the Person Responsible field will be allowed to update your note. If you checked the Update Access (Members), it means that the users you entered on the Members field will be allowed to update your note. If these Update Access is unchecked, you will be the only one who are allowed to update your note. Choose user(s) that are responsible for your note. You can enter the date when this note will be due. You can choose a status from the dropdown. The default status that were listed in the dropdown were Resolved, Priority 1, Priority 2 and Priority 3. You can indicate how many minutes the note should be finished. You can enter the name of the members you want to include in this part for the note to be created. This part will be disabled when the AVAILABLE TO ALL USERS checkbox is ticked. When you tick this, the members of the notes will be all the members in your project. When you tick this, the note will be pinned on your project’s dashboard. 4. Click Save to successfully create your note. Once you save your notes, it will now appear on your table.